Join us on October 7th for the All Candidates Debate for the Ward 7 School Trustee position. Where and When – Runnymede Public School Gym from 7:00 – 9:00 pm. This is a great opportunity to meet the candidates and help make educated decisions about the October 27th School Board Trustee election. Hear candidates present their platforms, answer some predetermined questions from Ward 7 Council Representatives and answer questions from the community members in attendance. The moderator will be Dan Abrahams, a local lawyer and parent who is also an excellent moderator, to which anyone who attended the spring provincial debate on education can attest. There are seven candidates running to replace Irene Atkinson, links to information on 6 of the 7 follows. This article poses some great questions about how municipal politicians and parents OUGHT to pay more attention to public education … if you are keen to have some good questions to ask all municipal candidates, have a read! 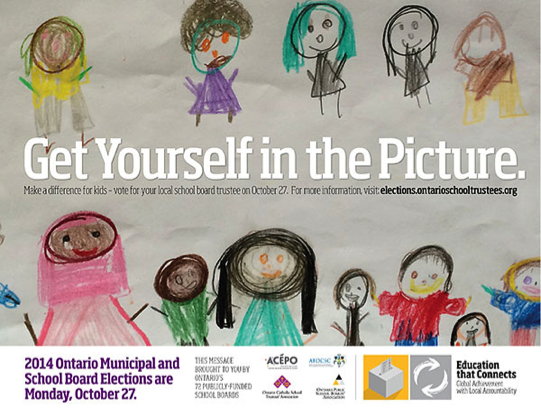 Visit this Ministry of Education funded website for an overview of school boards, trustees and all the candidates that have sent in their info to be posted. Additionally you may be interested to read this Villager article which highlights many issues facing Ward 7 Schools.